An ideal gift for a saxophonist or music enthusiast, this white Cappuccino Mug is decorated with a bold pattern featuring the image of a Saxophone and coffee-related words. 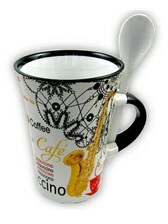 An ideal gift for a saxophonist or music enthusiast, this white Cappuccino Mug is decorated with a bold pattern featuring the image of a Saxophone and coffee-related words. A matching spoon, which can be stored in the handle of the mug, is also included. This Cappuccino Mug comes in a presentation box.